What many visitors (and even locals) don’t know is that there’s a whole museum dedicated to Egyptian artefacts – and it’s only a fifteen minute walk from the British Museum! 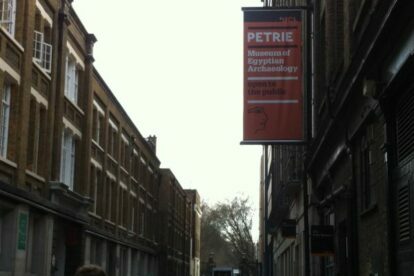 The Petrie Museum is located on the University College London campus and hosts over 80,000 archaeological objects. What I like most about the museum is that it focuses on the smaller objects that many people might gloss over at the British Museum. Everyday objects such as pottery, jewels and musical instruments can help give a clearer picture of what typical daily life was like for most Egyptians. The visiting hours are limited to afternoons, so it makes a perfect companion stop to your British Museum wander. I would recommend a morning visit with the Rosetta Stone, a leisurely lunch nearby, followed by an afternoon visit to the Petrie. You’ll have an Egypt-tastic day out!